Five out of seven days a week, I am wearing something with a collar. 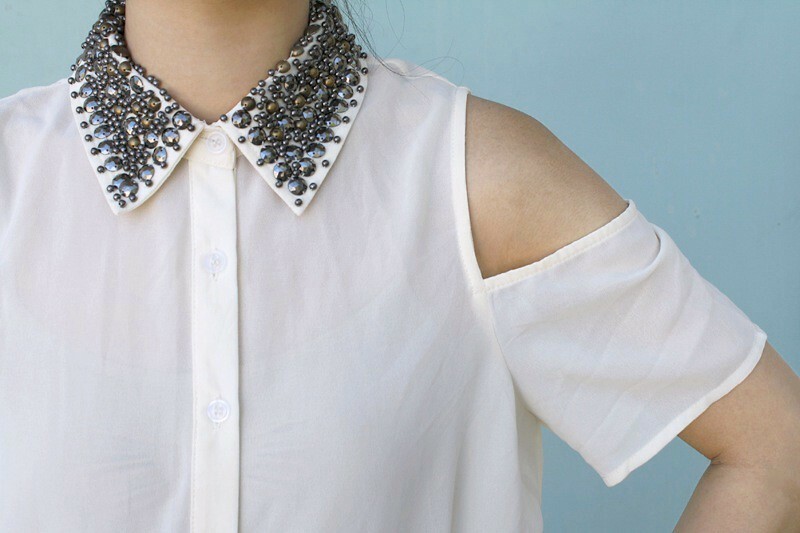 A collar can make a simple top or dress ten times nicer, and when it is embellished? Oh my! Even better! I am so excited about this lovely top Lulu's sent me. I adore the cut out shoulders, the sheer chiffon material, but most importantly the studded collar! It is gorgeous and I received so many compliments the day I wore it. I paired it with a cream crochet skirt, metallic peep toe flats, and a bright yellow satchel for a pop of color! Rolled my hair into a donut bun and called it a day! Studded collar cut out shoulder chiffon top by Lush c/o Lulu's. Crochet skirt by English Rose from my work Sway. Gorgeous shirt I love the cut out shoulders...adds edge to the outfit! It's easy to see why you received so many compliments - the whole outfit is perfect; such a pretty combination. This is so ethereal and lovely. You prove studs are not too heavy for summer! that shirt is just... amazing!